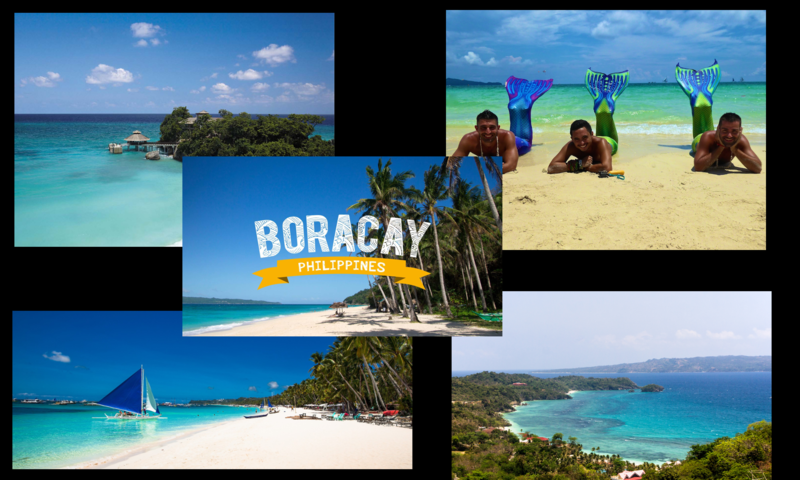 Boracay is a small island in the Philippines located approximately 315 km (196 mi) south of Manila and 2 km off the northwest tip of Panay Island in Western Visayas region of the Philippines. The island comprises the barangays of Manoc-Manoc, Balabag, and Yapak in the municipality of Malay, in Aklan Province. Tourism Infrastructure and Enterprise Zone Authority and the provincial government of Aklan administers the Boracay Island. Boracay Island is located off the northwest corner of Panay Island. It belongs to the Western Visayas island-group, or Region VI, of the Philippines. It is approximately seven kilometers long; The island’s shape compares to a dog bone. Its narrowest spot is less than one kilometer wide and has a total land area of 10.32 square kilometers. The Cagban jetty port serves as Boracay’s main entry and exit point. It is a south-facing beach and is located across a small strait from the jetty port at Caticlan. Depending on the wind conditions, the east-facing Tambsaan Beach serves as an alternate entry and exit port. There are two primary Boracay’s tourism beaches, the White beach and the Bulabong Beach. These are located on opposite sides of the Island’s narrow central area. The White Beach faces westward while the Bulabog Beach faces eastward. The island also has several other beaches. The White Beach is the main tourism beach; it is about four kilometers long a with resorts, hotels, lodging houses, restaurants, and other tourism-related businesses surround it. A Beachfront footpath which measures 2 kilometers in the central portion separates the beach from the establishments located along it. Several roads and paths connect the Beachfront Path with Boracay’s Main Road, a vehicular road which runs the length of the island. Located at the extreme northern end of White Beach, a footpath runs around the headland there and connects White Beach with Diniwid Beach. Bulabog Beach is located across the island from White Beach. It is the second most popular tourism beach on the island among the rest and is common for windsurfing and kiteboarding. Boracay has about 400 hectares of preserved forestland while 628.96 hectares of it are composed of agricultural land. The weather in Boracay has two seasonal weather patterns which are the Amihan and Habagat seasons. Amihan or northeast wind is characterized by moderate temperatures, little or no rainfall, and a prevailing wind from the northeast. In contrast, Habagat or southwest monsoon is characterized by hot and humid weather, frequent heavy rainfall, and a prevailing wind from the west. The main indicator of the switch between the Amihan and Habagat seasonal patterns In Boracay is the switch in wind direction. Amihan season happens on October until June while Habagat season comes within the remainder of the year. Finally, daytime temperatures on Boracay is 77–90 °F (25–32 °C) during the Amihan season on months of February or March. However, it increases to 82–100 °F (28–38 °C) when Habagat season starts. Temperatures fall below 68 °F (20 °C) during tropical storm periods. Consequently, tropical storm usually occur during the Habagat season. Next PostNext Which beach is similar to Boracay?